No one has claimed a wayward Chihuahua who earned himself the hashtag, #BayBridgeDog when he ran loose on the bridge Sunday morning. "Ponch" — nicknamed for Erik Estrada's character in the 1970s TV hit "CHiPs" — will be heading to foster care before Animal Care and Control San Francisco finds him a permanent family, the agency said Thursday on Facebook. The agency posted a picture of the pooch with a training supervisor, adding that he still needs some "serious quiet time." 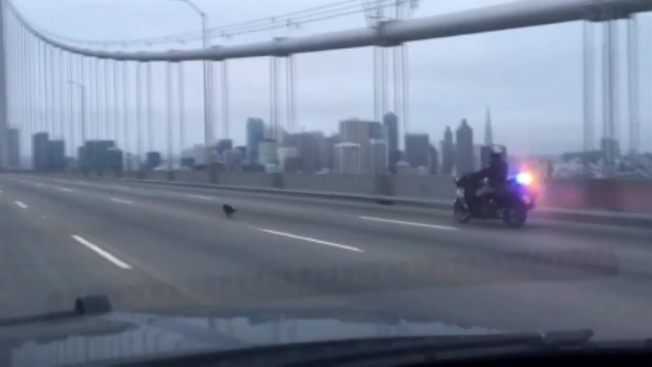 The pint-size dog raced across the westbound side of the Bay Bridge Sunday morning, where a motorcycle officer took video of the unusual scene, according to CHP Officer Vu Williams. Two officers were finally able to corral him and scoop him up. NBC Bay Area's Rhea Mahbubani and John Zuchelli contributed to this report.